In combination with information gleaned from your VPC Flow Logs, AWS CloudTrail Event Logs, and DNS logs, this allows GuardDuty to detect many different types of dangerous and mischievous behavior including probes for known vulnerabilities, port scans and probes, and access from unusual locations. Amazon GuardDuty is available in production form in the US East (Northern Virginia), US East (Ohio), US West (Oregon), US West (Northern California), EU (Ireland), EU (Frankfurt), EU (London), South America (São Paulo), Canada (Central), Asia Pacific (Tokyo), Asia Pacific (Seoul), Asia Pacific (Singapore), Asia Pacific (Sydney), and Asia Pacific (Mumbai) Regions and you can start using it today! 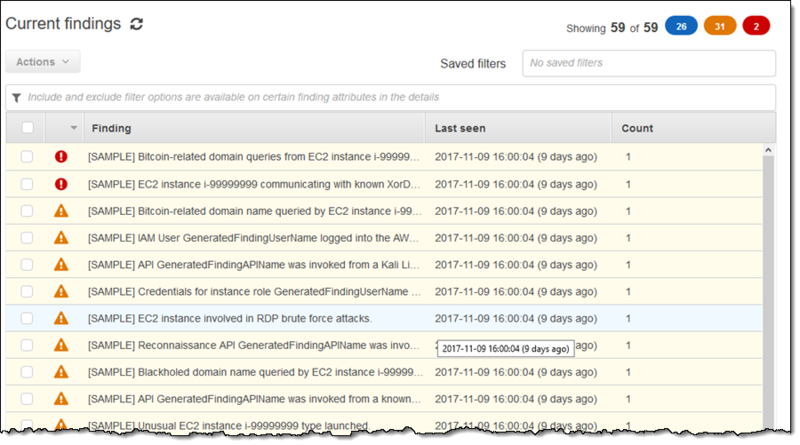 This entry was posted in AWS, Cloud, Computer, DNS, Murmuring, Network, Security, Service and tagged amazon, aws, cloud, cloudtrail, detection, dns, event, flow, guardduty, log, monitoring, security, threat, vpc on November 29, 2017 by Gea-Suan Lin.